Principle Six is: Small, Local, Cooperative. We believe that small, local, and cooperative producers are the backbone of healthy and sustainable regional food systems everywhere. 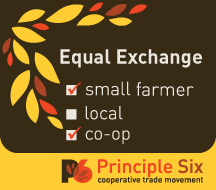 Created by cooperatives, Principle Six (P6) ensures that your purchases directly support small farmers, cooperative and non-profit businesses, and local farmers and producers. Whether your money moves nine miles down the road to Neubert Springs Gardens for locally grown and organically produced potatoes, or three thousand miles to Oro Verde, Peru, where Equal Exchange sources fair trade cocoa for chocolate bars, the transaction is transparent, inviting consumers to look closely at the source of their food. Together, Three Rivers Market’s members, customers, and producers are investing in an equitable and sustainable food system with P6 guiding us to products that meet our highest values. With P6, we can shop our values. By promoting the products and producers that meet our highest values, P6 engages and empowers consumers, building stronger cooperative relationships between farmers, manufacturers, distributors, retailers, and consumers. The sixth cooperative principle – cooperation among cooperatives – is the cornerstone of the P6 movement. Every time we purchase a product, we are engaging in trade. Behind every transaction, money exchanges hands and there is a potential to add value in the supply chain. But who gains, how much profit is made, and how the profits are used, are generally hidden. P6 de-mystifies all that goes on behind the scenes and, in the process, highlights where trade is conducted equitably. How can I tell which items are P6? Look for the label on the shelf or ask a staff member! Who is part of the cooperative trade movement? Why P6 matters to us. We joined P6 to highlight small, local, and cooperative products at our store. Buying P6 items ensures that your purchases directly support small farmers, cooperative and non-profit businesses, and local farmers and producers. With P6 signs and information throughout the store, we can simplify your shopping trip, making it clear where your dollars go and what they support. To learn more about the P6 movement visit P6.coop. Our P6 Cooperative Trade Movement launch event was held on August 25, 2013. See photos and read about it here: Sunday Supper at the Co-op.